Are Rose du Château roses real? How soon can I have my order delivered? Can I track my order? Eternity Roses - How does it work? What are the shipping costs? How do I place an order? Do I have to create an account to order the flowerbox? How can I pay for the flowers? Can I have the flowers delivered to an address at a particular time? How to care for the flowers? Are Rose du Château roses real? Definitely, yes. All of our roses are real - not artificial. Of course! We send the order always by UPS WORLDWIDE EXPRESS, which is fully trackable so you can know exactly where your package is. We have a dedicated transport system that in concert guarantees fresh flowers of the highest quality delivered right to your doorstep. Eternity Roses - How does it work? Eternity roses are a novelty on the market. These flowers are alive and due to the stabilization process retain their color and shape up to 2 years. They do not require any care. Moreover, it is a great surprise for allergy sufferers - roses are free of allergenic pollen. They are perfectly fitted into places such as boutiques, hotels, restaurants, and medical facilities because they do not require watering and what is more important do not fade. It is, therefore, a very good investment and elegant decoration also. Because we have to provide the best and the fastest courier services, shipping costs within the EU are 15 EUR. First, decide on the color and size of the box that is best for you, then choose the color of the roses that you would like to order. After you’ve made your choices simply click ADD TO CART, you can then continue shopping, or click ORDER NOW on the right side of the page to continue with the purchase. Click PLACE AN ORDER and fill out all the necessary information including your method of payment. Do I have to create an account to order the flowerbox? If You don't want to have an account, You can place an order without doing it. It is fast and You just need to fill in all necessary shipping data. How can I pay for the flowers? You can pay by credit/debit card by PayPal or SOFORT. All transactions are secure (and absolutely safe for our customers). Can I have the flowers delivered to an address at a particular time? Definitely! All you need to do is give us the address you want the flowers to be delivered to, and the estimated time – and we’ll do the rest! 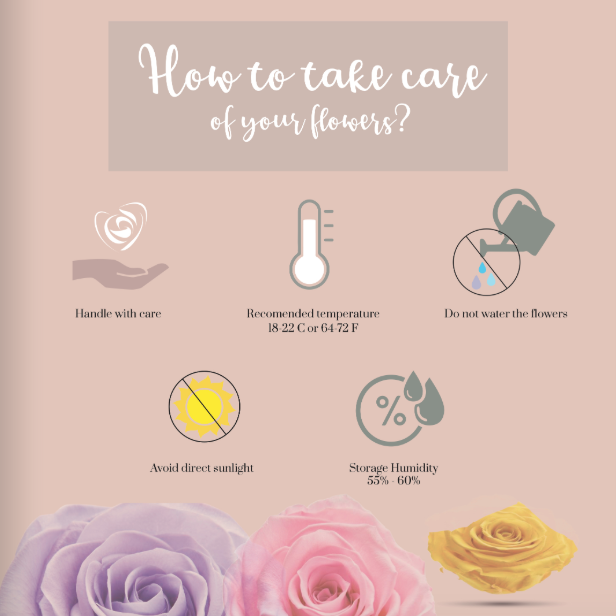 How to care for the flowers? Eternity roses do not require any watering. You do not have to take care of them, just remember not to keep it in the humid place, or in the sun.